For Pontiac GTO 2004 2005 2006 Power Steering Rack And Pinion. Guaranteed Exact Fit for easy installation. Fully remanufactured and tested OEM / OES unit - highest quality available. Thoroughly road simulator and pressure tested for proper operation. Assembled with inner tie rods, boots, and clamps. Manufactured to meet or exceed precise quality specifications. INTERCHANGES WITH THE FOLLOWING PART NUMBERS. 80-00928 R , 19102010 , 92161579 , 92184103. Power Steering - With 16mm Diameter Inner Tie Rods [OEM Number 92184103]. Power Steering - All Models. Basically, your existing part that you are replacing is your core. We need to get your core back so that we can eventually remanufacture it, and continue to supply high quality parts at an affordable price. 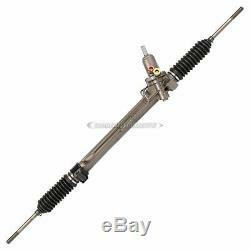 The item "For Pontiac GTO 2004 2005 2006 Power Steering Rack And Pinion" is in sale since Friday, March 2, 2018. This item is in the category "eBay Motors\Parts & Accessories\Car & Truck Parts\Suspension & Steering\Steering Racks & Gear Boxes". The seller is "greatautoparts" and is located in San Diego, California. This item can be shipped worldwide.